One of the effective ways to enhance your kungfu performance is to manifest the spirit of the forms you are performing. Needless to say, the purpose of enhancing performance is not to please spectators, but to improve combat efficiency as well as enrich our daily living. Manifesting the spirit of the Dragon when performing Dragon forms, for example, improves our presence of mind. Manifesting the spirit of the Monkey enables us to be agile and cheerful. We nurture our spirit, besides developing our energy and body. Hence, practicing kungfu is not just physical training but also spiritual culitvation. Please note: you can download the video clips onto your own computer and view them at your leisure. Place your computer pointer at the picture or one of the links, and right click. Choose “Save Target As”. Select the directory or sub-directory where you wish to keep the video clip. Click “Save”. Laughter is a regular feature in Shaolin Wahnam training. Grandmaster Wong says that instead of being a playful Monkey, Nick's movements are like those of a walking panther. This sets the class laughing. How would Nick change from being a Panther to being a Monkey? The size of the video clip is 0.57 mb. As mentioned earlier, Shaolin Wahnam practitioners are fast learners. Here, Nick is like a playful Monkey. But it would be a big mistake to think that his playful movements are for show only; they are effective for combat. Do you know how? The size of the video clip is 0.71 mb. Here is another Monkey — a big one. Charles' movements are fast, but they are also very powerful, though the uninitiated may not see it and therefore not believe it. The power comes from internal force. The uninitiated will also not realize that Charles' movements are very combat effective. The size of the video clip is 0.65 mb. Not only the form but also the energy and spirit of different styles are noticeably different. The energy and spirit expressed in these movements from the Pakua Set performed by Sifu Anthony are characteristically different from those of other sets. The size of the video clip is 1.64 mb. Manifesting the energy and the spirit of the form in your solo performance not only helps to enhance your combat efficiency but also develops desirable qualities that enrich our daily life. Do you know why this is so. The size of the video clip is 0.66 mb. Grandmaster Wong comments that Black Tiger steals heart, and not steals stomach, and should be executed with the energy and spirit of the Tiger. The size of the video clip is 1.20 mb. Grandmaster Wong advises that when executing “Black Tiger Steals Heart”, the energy should be shot out, and not pulled back, and it should be executed with the spirit of the Tiger. “Black Tiger Steals Heart” is poetic; its technical name is “Bow-Arrow Arrow Punch”. The punch, therefore, should shoot out like an arrow. The size of the video clip is mb. Chris also performs patterns from the Shaolin Five-Animal Set. The performance is good as the forms are expressed with appropriate energy and spirit. Can you see the difference, for example, between the Snake and the Crane? The size of the video clip is 1.25 mb. Kungfu Practice is Not Just Physical Training but also Spiritual Cultivation from Wong Kiew Kit on Vimeo. Can Sophisticated Kungfu Techniques be Used in Combat? Can your Responses still be Correct and Spontaneous in Real Fights? 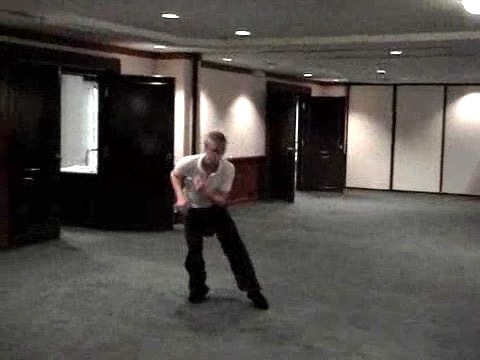 Can Beautiful Patterns and Flowing Movements be Effective in Combat? Felling Opponents with your Stances!